Because rolling processing is the processing method of roller rolling, the roughness of the surface after processing is affected by the height and shape of the convex part (that is, the state before processing). If the surface state before processing is rough (the convex part is high, and the concave part is deep), the convex part cannot be completely embedded into the concave part, resulting in rough surface processing. In addition, the shape of the raised part also affects the processed surface. Generally, the better the surface condition before processing, the better the surface condition after processing, and the less abrasion of rolling head. If necessary, an additional procedure can be added. Since rolling processing is the processing method of roller rolling, the diameter of the workpiece before and after processing will change (the inner diameter will expand, the outer diameter will decrease). In order to be able to process into the dimensional tolerance range, this change should be taken into account to determine the size of the previous process. The change in diameter is related to the material, hardness and rolling capacity of the workpiece. Therefore, the size of the workpiece shall be determined after 2-3 trial machining. The standard model of rolling head has straight shank and morse taper shank. Rolling and cutting machining is different, do not require large torque, small power machine tools can also be used. 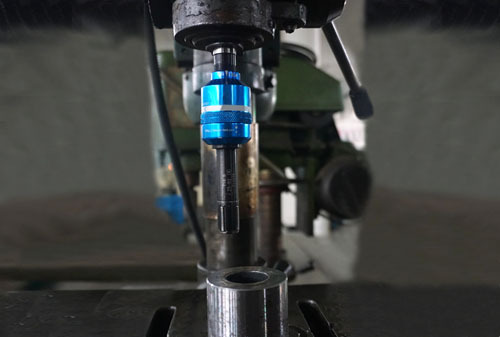 It can be installed in drilling machine, lathe, hexagonal lathe, boring machine, drilling machine and other equipment for processing, and do not need special equipment. Because rolling processing is the use of roller rolling processing, so it will produce fine dust. Dust not only affects the surface quality, but also accelerates the loss of rolling head, so it is necessary to inject a large amount of cutting fluid to remove dust. Low viscosity cutting fluid should be used in rolling processing. High viscosity cutting fluid although lubricity is good, but its cleaning performance is poor, not suitable for rolling processing. The company has rolling processing special rolling lubricating oil, as long as the low viscosity cutting fluid mixed with 5% rolling lubricating oil, can play its outstanding performance. Rolling processing is the use of roller rolling processing part of the surface to make it compact. Therefore, in order to be able to withstand the pressure of processing, the waiting part should have a full wall thickness (20% of the inner diameter). If the wall thickness is too thin or part of it is thin, it will fluctuate or decrease the roundness after processing. Usually according to the following methods to solve the problem: (1) reduce the rolling amount; (2) use fixtures to support the periphery; (3) roll machining is carried out before cutting thin wall thickness. The upper limit of hardness of workpiece machinable by rolling head is 40HRC, but we also specially manufacture rolling head for high hardness workpiece (the upper limit of hardness is 55HRC). When rolling the workpiece with high hardness, the tool life will be shortened due to the large pressure that the processed part bears. Therefore, in order to obtain the machining surface with required precision, the main measure is to reduce the rolling amount. 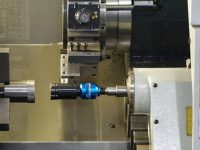 Rotate the rolling head to the right for rolling processing; The rolling head can also be fixed and the workpiece can be rotated to get the same result. The rotational speed and feeding speed are different according to the machining diameter. Posted in RBT News and tagged attention points of using roller burnishing tools, hardness of rolling processing, principles of rolling processing, Processing conditions of using roller burnishing tools, roller burnishing tools, rolling processing, rolling processing methods, rolling processing tools, size of rolling processing, speed of rolling processing, wall thickness of rolling processing.